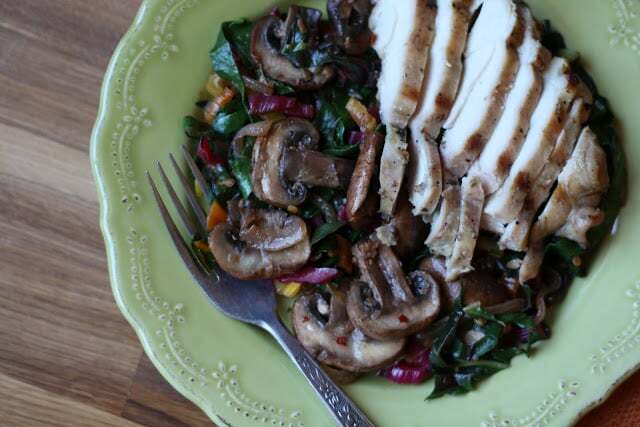 Garlicky sauteed mushrooms, tender onions along with crisp and colorful Swiss chard made the perfect lunch when topped with leftover lemon chicken. Greens and lemon flavors pair together deliciously, so when I had a few pieces of this Lemon Lime Grilled Chicken leftover, I knew exactly what I wanted to make. I liked this combination so much, I’m crossing my fingers for more rainbow chard in my next CSA box. In a large skillet over medium heat, warm the oil and add the garlic. Saute for about 30 seconds and then add the onions and stir to coat with oil and garlic. Continue cooking for a couple minutes, until it starts to become fragrant. Add the mushrooms and stir to combine. Add the salt and red pepper and toss to coat well. Cook for about 4-5 minutes until the mushrooms are tender. While the mushrooms are cooking, shake any excess water off the Swiss chard and then remove the stems. Slice the stems very thinly and then add them to the skillet. Stir to combine. Slice the remaining leaves into ribbons and then add to the skillet with the rest of the vegetables. Toss well to coat with oil and seasonings. Saute for another 2-3 minutes until the greens are just barely wilted. Top with grilled chicken if desired and Enjoy! How pretty are the little stems of the chard coloring the dish? Nothing like some garlicky greens and mushrooms together. The grilled chicken topping it off sounds like a perfect lunch! This looks delicious and I am now totally craving it! Sounds delicious! I am going to be growing rainbow chard in my garden this year so I will pin this for later in the spring! That looks great, and your picture is awesome. Sounds like a great side dish, with lots of color. I need color on my plates! Your beautiful chard is so making me miss my CSA baskets. So sad. :( We don't have a good CSA here. I have tried to, and ended up with old, unusable vegies half of the time. 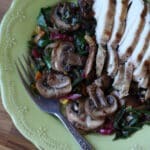 Your swiss chard looks vibrant, gorgeous and delectable with those mushrooms and paired with that lemon lime chicken....so very delish. Looks good. I have never tryed chard but will with this recipe! I love the color of that chard. Along with the mushrooms it sounds like a delish combination! The color of the chard is beautiful. I love the combination of flavors. That looks delicious, I love garlic and greens together, such a great combination! Haven't seen rainbow chard in our markets but I really like how you put this dish together.